If today’s sports utility vehicles are the winkle-pickers (Google it) of the automotive world, all-wheel drive wagons are the lace-up brogues; what your mother might call ‘sensible shoes’. For those with little history, think Sean Connery, rather than Johnny Depp; ruggedly handsome, against off-beat and quirky. 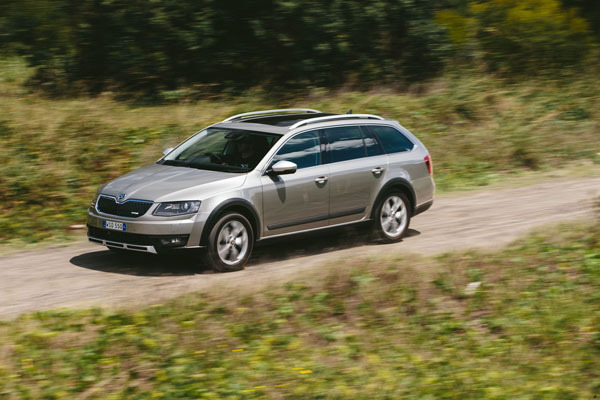 The Skoda Octavia Scout is a perfect example of the former; always has been. The vehicle is 4685 mm long, making it 101 mm longer than its predecessor. The 100 mm longer wheelbase (2679 mm against 2577 mm) emphasises the new Scout’s filled-out proportions. Front overhang, now 899 mm as opposed to 925 mm gives it more rough road ability. Importantly, ground clearance has been raised to 171 mm, 31 mm more than the standard Octavia. The profile of the 225/50 R17 tyres on the 17-inch alloy wheels is higher too. There are protective plastic covers for underbody components as well as the brakes and fuel lines. Increased exterior dimensions leaves more space inside the cabin. Legroom in the rear has grown by 26 mm. Elbow room has also increased significantly, as has shoulder space. Compared to the previous Scout, boot volume has grown by eight litres to 588 litres. Folding down the rear seats boosts boot capacity to a remarkable 1718 litres, from 1620 litres. Using a drawbar, the rear backseats can be conveniently folded down from the boot. When the front passenger seat is folded down, items up to 2.92 metres long can be accommodated. The new Scout’s power tailgate swings open at the press of a button on the key fob, making loading convenient. The loading sill is a handy 667 mm above ground, 5 mm lower than the in previous model. For the first time, the cargo compartment is fitted with a double-sided floor mat. For normal use, a high-quality carpet provides a look of prestige. Flipping the mat exposes a dirt and water repellent surface to carry muddy sports equipment or potted plants. A cargo fastener is a new optional feature allowing such items as boxes to be secured in the boot. The fastener can be stored in the boot’s side. The 135TDI test car, over the base 110TDI, benefits from an eight-inch touch screen and Columbus satellite navigation system with integrated audio including Bluetooth and streaming, USB, Aux and SD card slots and eight speakers. On offer is a 110 kW diesel engine combined with a six-speed manual transmission and a choice of either a 135 kW diesel or 132 kW petrol engine coupled with a six-speed automatic dual clutch DSG transmission. Our test vehicle was fitted with a VW-sourced 135 kW 2.0-litre TDI turbo-diesel engine mated with an automatic six-speed dual-clutch DSG transmission and all-wheel drive. The new Scout 4×4 has advanced all-wheel drive technology based on a fifth-generation Haldex clutch and electronic differential lock. These contribute to optimum traction on slippery surfaces and excellent hill-start characteristics. For the first time, the Octavia Scout features a knee airbag for the driver as well as two rear side airbags. Nine airbags in interaction with three-point seat belts protect the occupants from injuries. The 135TDI features assistance systems such as Multi-Collision Brake and Fatigue Detection. The Multi-Collision Brake automatically slows the vehicle after a collision is detected, even if the driver no longer presses the brake pedal, to avoid a further collision, or the speed at which any other collision may take place is reduced. Fatigue detection analyses the steering behaviour 15 minutes after the engine has been started and stores the result. In this time frame the driver must keep a speed of more than 65 km/h. A significant deviation from the characteristic steering behaviour will indicate fatigue of the driver, triggering a visual message in the cluster instrument – ‘fatigue detected – please take a break’. The 135 kilowatts of turbo-diesel engine mated to a six-speed DSG transmission and all-wheel drive had the test car up to cruising speed with little effort and at a pleasantly quiet manner for an oil burner. Road noise was kept to a minimum, adding to a feeling of wellbeing for up to five occupants. The increased exterior dimensions and longer wheelbase made for spacious surroundings and a cargo area many sport utility vehicles of similar size could not match. Instruments were clear and concise and positioned to give the front seat passenger a share of the info available to the driver. The comprehensive range of controls, with a nod to Audi / VW, was intuitive, audio selection, for example, being summoned by the wave of a hand close to the eight-inch screen. Skoda claims fuel consumption of 5.3 litres per 100 kilometres and carbon dioxide emissions of 139g per kilometre for the 135TDI on the combined urban / highway cycle. The test car recorded 4.7 litres per 100 kilometres on a run from the Gold Coast to the Darling Downs and back; and between 8 and 9 litres per 100 kilometres on the day-to-day city commute. Weight savings all round and the use of stronger steel have given the wagon an even more solid ride and improved handling. Electronic Stabilisation Control which can be adjusted to suit certain driving conditions at the touch of a button. By briefly pressing the ASR button, traction control is turned off. When the ASR button is pressed and held, a dynamic ESC mode is activated which provides even more agile handling characteristics. The vehicle will tow up to 1800 kg. With greater angles of incline than previously, from 16.7 degrees at the front and 13.8 degrees at the back, the Scout can also handle relatively demanding terrain without fuss. Nothing has dated. The Skoda Octavia Scout is still a typical example of the station wagon genre with some off-road capability. Now it comes with the greater technology and at keener prices. Note: These prices do not include dealer or government charges. 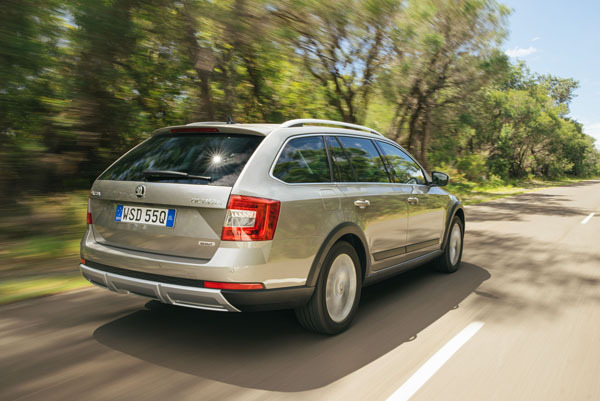 Contact your local Skoda dealer for drive-away prices.